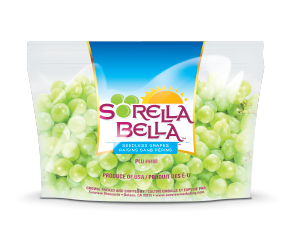 Inspired by our Stella Bella™ variety, Sorella Bella™ translates into “Beautiful Sister.” It was developed after years of trials from our in-house vine breeding program. This green seedless grape has an elongated shape and sweet crisp that makes it easily enjoyable. Available in September and October. 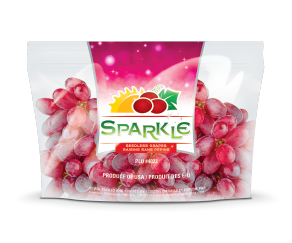 Our Sparkle™ is grown exclusively in California, and available in July and August. This red seedless variety is recognized by its large berry size and elongated shape. It is bright in both color and flavor. 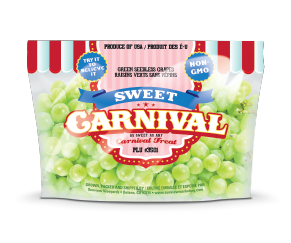 Our Sweet Carnival™ grapes have a unique flavor reminiscent of your favorite carnival treat. So sweet and delicious, these grapes are sure to please the entire family. Developed using a traditional, natural breeding process, these green grapes have an unbelievably sweet taste and are non-GMO. Available August to October.